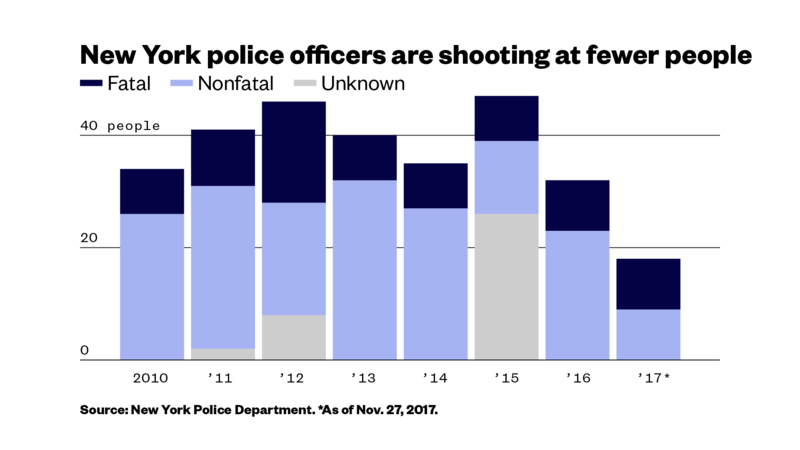 New York City police officers shot fewer than two dozen people this year, a record low and the result of major shifts in policing practices that have led to drops in police shootings around the country. By the end of November, New York City police officers had shot 18 people, half of them fatally, according to data obtained by VICE News. The New York Daily News reported updated numbers Thursday showing officers fired their guns in 23 incidents in 2017. Shootings were down 44 percent from 2016, when New York police shot at 32 people. That’s less than one person for every 100,000 city residents. With around 34,000 full-time sworn officers, the New York Police Department has almost three times as many officers as the next-largest local department in the country, but they shot about half as many people. Los Angeles Police Department officers shot at 42 people in 2016, and Chicago cops shot at 65 people last year. The New York Police Department didn’t return a request for comment on the decline in shootings. A VICE News investigation of the country’s 50 largest local police departments published earlier this month found that both fatal and nonfatal police shootings are falling in the largest departments. In 2015, months after Eric Garner gasped “I can’t breathe” as an NYPD officer held him in a chokehold that killed him, the NYPD set up a special, centralized unit devoted to investigating the use of deadly force among officers across the city. Before that, each city borough had conducted its own investigation. Wexler said that policy changes such as banning shooting at cars, along with more supervision, also helped New York police cut down on shootings. In 1972, New York officers were involved in almost 1,000 shooting incidents — including suicides and animal shootings, not just people — but by 2015, they were involved in just 67.